Spiced Chocolate Krinkles | What about this? 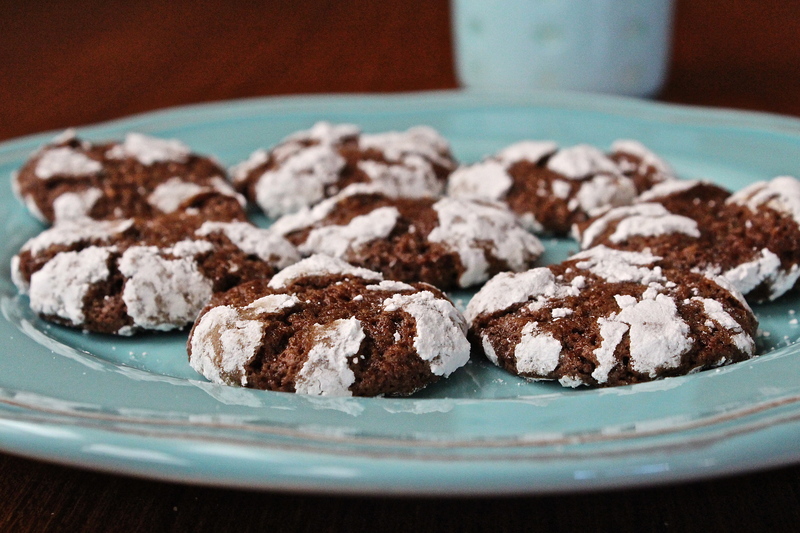 Add a little spice to your life and tantalize your taste buds with one of these cookies. At first bite, you’ll discover a rich chocolate flavor with a touch of sweetness, but then, as you’re about to swallow this little bit of naughtiness, a warm and spicy sensation floods your mouth. Ground ginger, freshly-grated ginger, and cayenne pepper provide the cookie with a surprising “afterglow.” A perfect treat anytime, but especially on a cold and rainy day like today! 1. Put the oil, chocolate, both gingers, the cardamom, cayenne, and salt in a double boiler or in a heatproof bowl set over a saucepan of gently simmering water and melt the chocolate, stirring occasionally. Remove from the heat, transfer to a bowl if necessary, and cool completely. 2. Sift together the flours, cocoa powder, and baking powder and set aside. 3. When the chocolate mixture has cooled to room temperature, add the egg, sugar, and vanilla extract and stir just until combined. Gently fold in the flour mixture until well incorporated. Transfer the dough to a large sheet of plastic wrap, flatten into a 1-inch-thick disk, and wrap tightly in the plastic. Chill until hard, at least 2 hours or up to 5 days. 4. When ready to bake, preheat the oven to 375 degrees F. Line two baking sheets with parchment paper. 5. Put the confectioners’ sugar in a small bowl. Pinch off a piece of dough, form it into a 1/2-inch ball, roll in the confectioners’ sugar until well coated, and place on a prepared baking sheet. Repeat with the remaining dough, putting the coated balls 1 inch apart on the baking sheets. 6. Bake the cookies until the tops look cracked and are dry to the touch, about 10 minutes. Transfer to a cooling rack to cool completely. The cookies can be stored in an airtight container for up to 2 days. 1. An easy way to peel fresh ginger is to scrap off the “skin” with a teaspoon. 3. My cookie dough turned out to be more loosely formed than a dough. I attribute this to using an extra large egg. The dough did firm up a bit after chilling it for a couple of hours. 4. To prevent the dough from sticking to my hands while rolling it into balls, I repeatedly wet the palms of my hands with water. Keep a small bowl of water nearby.